GORGEOUS! High quality comforter and matching pillows. Love this purchase. This beautifully tufted bed is from the Jacqueline bedding collection. Its deep plum coloring makes this set create a statement in your bedroom. The collection is made from 100-percent polyester polyoni and has pieced fabric sewn together to give this set dimension. It is finished with a smooth edge of fabric that creates a beautiful border around this comforter. Comforter is a little too short and the skirt is a little to long. Comforter does not completely drape the 13 inch matress and the skirt reaches over the frame by two inches. Was looking for an item that would fit out of the box but didn't happen. This comforter set is beautiful! Looks just like the picture. The exterior fabric is a little stiff feeling but the underside of the comforter reminds me of fine crushed velvet and is very soft and smooth against your skin. Not too hot and not too cold with the a/c running ( currently August in NY). My husband loves it too! This set has the matching shams,3 accent pillows and bed skirt. We bought a jersey sheet set in white to compliment it. Love it! My favorite bedroom set! I gave this item 3 stars because of the size. This is a beautiful piece. However, it is very small. I really need another 4 or 5 inches. Do not buy if you have any additions to your matress such as a feather tick. This comforter will never cover any additions at all. You do get quite a few pieces for the money. However the fabric is cheaper and the x design comes out and needs to be sewn or repaired fairly regularly. We had some more expensive throws to upgrade the look of the bed and used only a folded section of the comforter for the display of the bed. Not very soft so we tend not to use it directly on us. I have been looking for a while for a comforter like this. I knew the color that I wanted & pretty much the style that I wanted it in, but couldn't find it anywhere that I liked until I came across this one. It is absolutely beautiful! It is well quality made and looks more expensive than what it is. My sister was visiting from out of state when it came in, and she loved it just as much & wants one too! It also comes in the ivory color as well as the plum that I ordered. She's been undecided on colors just yet. Love my new bedroom comforter set!!! Thanks Overstock, keep up the good work! BEAUTIFUL SET! great quality, would recommend to any one, I bought the plum set and it's the same color as the picture. This comforter and pillows are lovely, but I would recommend them for a fuest room or someone who is very careful with their bedding. It is SPOT CLEAN ONLY. No dry cleaning allowed either, kind of like a designer dress you can only wear once. If you don't mind taking it off of the bed everynight, and can avoid touching it with anything but clean hands (no lotion/greasy creams), then this may be for you. It looks like silk, is polyester with a nice sheen, but is very fragile due to the stitching in the center of each square in the design. Please not this is a true plum color, a brownish purple. Looks regal, just don't expect a true purple or royal blue. Pillows are nice, I don't care for the little one with the design on it, but the others are nice. Overall, I love this set, but so am very careful with my bedding. Beautiful! I absolutely LOVE my new Clay Alder Home Red Cliff Plum 7-Piece Comforter Set! I bought this because I needed something to go with my sheets. Since this exact shade of purple is my favorite color, I had to snag it up! I got a pretty good price for it too. You do have to be a little careful with the pleats and folds in the design, but it is elegan looking when it's all made up. I'm not to keen on the throw pillows though. I don't think they make sense to me in my humble opinion, but my little doggies love to curl up with them so everything worked out perfect! I absolutely recommend this Comforter Set. Love the color plum. Now I just have to get the matching valence. Do you have it? Gorgeous! Beautiful color. Waiting to paint room before using it, can't wait though. Very soft and feels to be very comfortable. Accent pillows are great, but personally I'll be changing them out to add the bedroom theme since it's a solid color. The Tufts make the the solid color not so dull by adding eye appeal. I highly recommend this set, Clay Alder Home, as well. My guess is this is representative of the quality of their products. looks great and the color and size was perfect. This comforter is not as puffy or full as I would have liked. The color is okay, wish it were a bit brighter and didn't realize that the piping around the edge was grey vs purple. I will keep it because the price was good but only an average purchase. I loved the picture I saw of this set. I bought it and it looked beautiful but when I slept in it it was super scratchy and uncomfortable. Then I made the mistake of washing it and it pretty much ruined the material inside the comforter. I went back to my target bed set. I was ecstatic when i found this set. The color and style is beautiful. I have very dark furniture and was hoping this wasn't to dark, but it wasn't. The silver grey piping broke it up very nicely. The color looks great against our dark wood bedroom set and the accent pillows are definitely a plus! This Comfoter set is a Beauty! Well made, warm and Chic! It makes my room very glamourus! It was packaged well and arrived quickly! I highly recommend this Beautiful Comforter Set! I love the bed set. But was expecting a little better quality for the price. But still. I am pleased with it. I really like the plum color seem. And the decorative throw pillows are really nice. Thanks Overstock!!! Beautiful plum color. Easy to wash. Top of the comforter is a little scratchy. If you have cats won’t recommend it there claw pull the strings. It’s a nice set but the color is a little different than I thought. So I haven’t used it in this house but I plan to use it in the next one. This looks a little more lavender in the photo although it’s Plum it doesn’t have as much blue gray. Beautiful set; exactly as pictured. This comforter is very beautiful! I'm so happy I purchased it. I would recommend to a friend. It's pretty haven't opened yet received today can't wait to use. The color was beautiful. I just wished it hung longer. I guess I would need to go a size up to achieve the hang I’m looking for. Overall, I’m pleased with the set. I would purchase the brand again. "Hello. I'm ordering item #21181064. Can the draperies for item #25448113 be ordered separately? Thanks LP"
Please be advised there are no draperies included for this item. "Will this guy an over sized king bed it is high off the grounds"
I just ordered this myself and my king size bed is high off the ground also. I went with California king and it fits perfect. Love it! It is a little darker than appeared in picture but I still love it. If it very high off the ground no the bed skirt will not reach the floor. "I am having problems with the stitching unraveling.I;m dissapointed but would like to save it from further unraveling.HOW CAN I TIGHTEN THE STITCHES.IT'S ONLY BEEN 6 DAYS????" Mine is perfect with no stitching issues. Do you have pets on your bed? If not I would contact Overstock returns before it goes for too long. I've not had any issues with stitching it is a beautiful comforter. I would contact Overstock returns they are wonderful. "I am concerned with the underside of the comforter. What material is on the underside? I have found polyester slips & slides during the night & never stays on the bed. T"
I haven't had any issues with sliding. 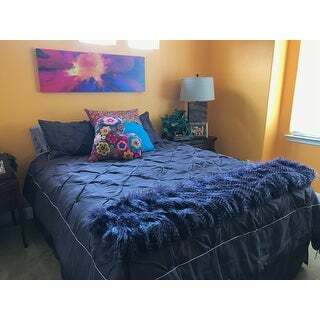 The color is darker than the picture but the comforter is beautiful nonetheless. I love it because it 's easy to make the bed. Hi, it is the same material on the opposite side, but not decorative. It's really a great deal though! The sheets I have on my bed I bought from Overstock also, a deep purple, there satin, and they don't Slip and slide. Yes, this can be washed. Yes, it can be washed. "What color are the decorative pillows?" Please click on the second picture for a better view on the decorative pillows. same as comforter or coordinating. Very pretty! "Can you tell me about the pictures in the display? Their name and cost? Thank you."